"Mapping the 'White, Marmorean Flock': Anne Whitney Abroad, 1867-1868"
The Digital Scholarship Initiatives (DSI) program in the Library and Technology Services division of Wellesley College provides project management services and coordinates collections and infrastructure support for faculty-driven digital scholarship projects. In 2014, the DSI program collaborated with Jacqueline Marie Musacchio, professor of art, to produce two digital exhibits to accompany her scholarly article based on archival letters held by the Wellesley College Archives. 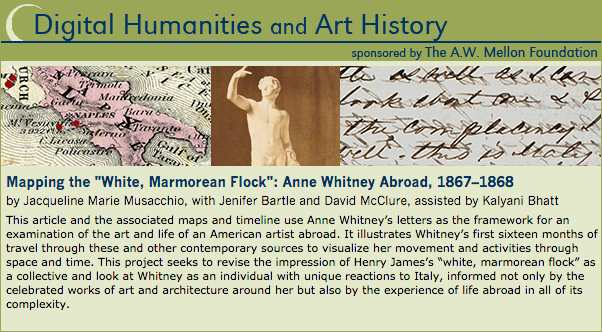 The article, entitled "Mapping the 'White, Marmorean Flock': Anne Whitney Abroad, 1867–1868,” was published in October 2014 as part of the Mellon grant-funded Digital Humanities and Art History initiative at Nineteenth Century Art Worldwide. The article was accompanied by two rich digital map and timeline exhibits built in Neatline, a plug-in for the open-source Omeka platform. The exhibits visualize the European travels of a nineteenth-century American woman artist, using her letters and contemporary maps and images to enrich the narrative. DSI support for this project included tool selection advice; the direction of Neatline interface customizations, done by Neatline developer David McClure; project planning and management; digital collection support for the archival letters and maps on which the exhibits are based; administration of web servers; Geographic Information Systems support; and end-user Neatline training.